ROI offers a complete Honeywell RFID product suite, including readers, printers, tags, labels and inlays supported by RFID implementation services to guarantee system performance, all from a single source. 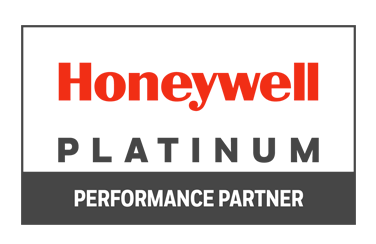 Designed for global use, Honeywell supports EPC Gen 2, and ISO 180006b and 6c standards and meets ETSI and FCC RF certifications. Our certified compatibility with enterprise software such as IBM®, SAP®, Oracle®, Sun, Microsoft® BizTalk Server makes integration for customers seamless. Honeywell's innovative product designs help meet the needs of particular use cases such as the RFID Forklift with integrated computer, reader and antennas. Joining the diverse line of RFID readers are the Honeywell RFID antennas, including antennas specifically designed for fixed applications as well as vehicle mount applications where shock and vibration can far exceed average industry specifications. Honeywell RFID antennas provide the vital link between reader and tag, serving as the conduit that moves data back and forth. Honeywell fixed RFID readers are designed to meet the highest industry and deployment standards. From reading pallets moving through portals to cartons on high speed conveyor belts, Honeywell’s fixed readers are rugged, easy to configure, and provide control of peripheral devices and sensors for effective, accurate RFID supply chain management. With Honeywell RFID printers at the center of your RFID application, you can simultaneously print, encode and verify frequency-agile RFID labels with confidence and ease. The printers easily integrate into industrial manufacturing, warehouse and logistics applications, ensuring all items are labeled and tracked via RFID for quick and accurate data collection. Honeywell's passive UHF RFID tags and smart labels are capable of receiving, storing and transmitting digital information in multiple frequencies for global supply chain support. Across the supply chain, forklifts and trucks are being transformed from material handling vehicles to information technology tools. Vehicle mounted RFID means that systems get used more often in more places, producing greater return on investment. Honeywell’s vehicle mount reader delivers the ultimate mobility in RFID supply chain management without having to change your current process. Instead of moving material to read it, you can read it while it is being moved – at the dock, on the warehouse floor, in the trailer or in the yard.